down the road, going through Eudora to Tellulah, LA to get on I-20. Well, there was a problem. Not far from Mound, the traffic came to a dead stop. We waited on the pavement a while, and when traffic scooted up to a state trooper standing by the road, we asked him what was going on. Turns out a barge had hit the Mississippi Bridge at Vicksburg, and an inspector was on the way to make sure it was safe. We did what most anyone would do – pulled off the road and waited. Except the exit we pulled off at had just two businesses – and there was standing room only at the gas station. So we pulled into the other parking lot, that of an adult store. And being hungry, we dug into that sack of tamales. Now, here’s a good reason to keep a roll of paper towels in your car. Rhoda’s tamales are many things, and most of all they are moist. We tore open that bag to find an aluminum foil wrapped bundle. Through that, there was newspaper – a lot of it. I unwound the newspaper to find another aluminum foil wrapped bundle, and through that there was wax paper, and more aluminum foil and a paper boat that had all but disintegrated from the juice of a dozen cornhusk wrapped beef-and-chicken-fat tamales. It would go to figure that when this package had been unwrapped in my lap, that I’d remember I didn’t have any sort of utensils with me. It didn’t matter… we ate them with our fingers out of the remnants of that package, and at that moment it was the best thing I’d ever eaten in my life. But that only tells you a little bit – about that fantastic tamale experience. Rhoda knows her tamales are good. 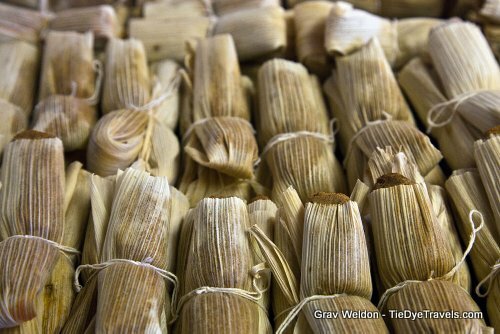 She never made a tamale in her life until someone said she should, and that night her family sat up together and made tamales and wrapped them in corn husks and tied them until the wee hours – and the next day she sold every single one. And she still usually sells them all – but that’s partly because she’s such a good saleswoman. 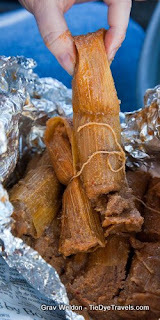 Every day except Sunday, Rhoda gets up and packs hot tamales – a dozen in a bag, three dozen in a coffee can, as many as she thinks she can part with – and puts them in her van. She then drives from place to place around town selling them. She goes to the RV parks, to the banks of Lake Chicot and to the parking lot of home furnishings legend Paul Michael’s (where staffers will tell you how she honks, sometimes until customers vacate the store) and sells them. Then she heads back to the store for the lunch rush. 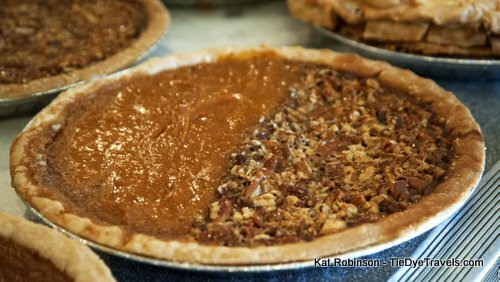 Rhoda started with sweet potato pie, and the Arkansas Pie book will tell you more about that. 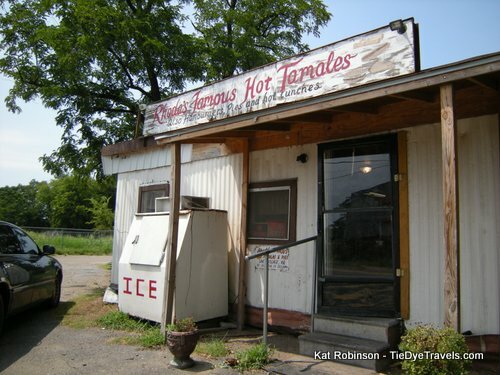 And she’s famous for those tamales, not just because they’re good but because she’s one of the few stops on the Tamale Trail (Pasquale’s being one of the few other Arkansas entries in a Mississippi dominated list) and she does good press. She can also talk the legs off a mule; a few months back I was down there with a group of my colleagues and I was determined not to get more than a little pie, one of those little three inch pies, for lunch. 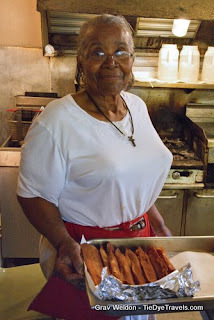 I walked in and got my lunch and she told me I was going to buy one of her half-and-half pecan and sweet potato pies. And she was right. I did. 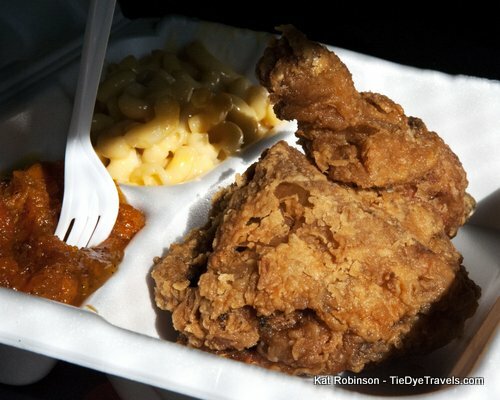 But Rhoda’s also a master of another Arkansas staple: fried chicken. It’s out and ready to go most days, and it’s exquisite. Salty, juicy and an orange gold; it’s bird is meant for consumption with white bread and sweet potatoes, preferably with sweet tea. It could be the best fried chicken I have ever had. Rhoda Adams recently changed her sign. I don't know if I had any influence on it or not, but I'd like to think I did. 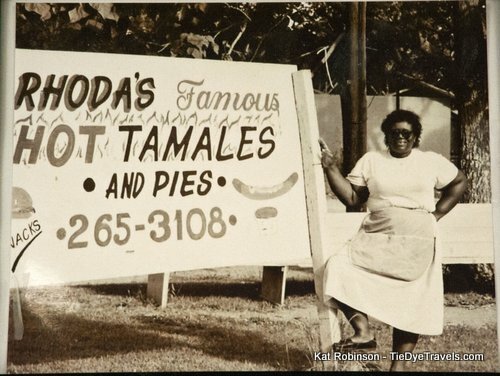 It's now Rhoda's Famous Hot Tamales and Pies, like it was when it was first opened, a sign once again hand lettered red and black on a whitewashed board above the door. Rhoda's isn't anything fancy, but Ms. Adams knows how to make good food and how to market herself well. She's an Arkansas classic. Get yourself down to Lake Village and turn on St. Mary's Street. And don't cry if you miss the tamales, because you know she's going to hook you up with some pie. Like this story? Check out Classic Eateries of the Arkansas Delta.